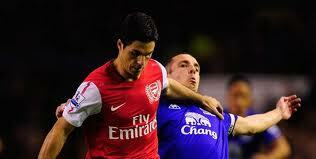 Match day today, the Gunners face a tough game away to Everton at Goodison Park. To gain three points tonight would call upon all the players bringing their A game with them. We are boosted by the news that Theo Walcott returns to fitness and should play a part in the game. We badly missed the outlet of Walcott’s pace on Saturday and his return is a timely boost to the team. He has become an important part of our attacking game and maybe finally reaching the level of consistency that has been missing from his game over the years. The fact that he has reached this not playing in his preferred central role is worrying for all those wanting him to sign a new contract. It has come to the point where his departure would be a massive loss to the team, we need him to sign a new contract and by that we need to keep him happy. Money shouldn’t be an issue, given the multi million pound deal signed with Fly Emirates last week. We will need to keep a close eye on the developments as time moves ever closer to the midseason transfer window. One thing that can’t be read into too much is the talk of the selections for the 2013 calendar. The fact Theo is not included on the calendar could be down to mere coincidence. Each month contains a single player, that’s 12 players from a squad of 30 strong, some players will miss out, it’s simple maths. Calendars and club catalogues can draw all sorts of confusion just by who is selected to front the pages, I would not stress myself trying to predict our transfer dealings based on a calendar. Right now in my office at work I have an Arsenal calendar with the November picture of Samir Nasri and Robin Van Persie celebrating a goal. Can’t even bear to look at that thing, Calendars are more hassle than they are worth. Everton will have Fellaini back after serving a one match suspension, it will be important that the defence are fully focused to contain the threat of the Toffee’s in form player. The two recent clean sheets will be a welcome psychological boost to the defence, the threat stems throughout the Everton team from the quality delivery of Baines from the wing to the trickery of the likes of Pienaar and Mirallas. Even though our past few games against Everton have been positive results the performances themselves have required hard ground out ethic. On paper we have every chance in reality it’s 50/50. In addition to Walcott there’s a chance for fresher legs to return to action against Everton: Jack Wilshere, Bacary Sagna, and Thomas Vermaelen may be utilized. Although we never suffered any injuries from the Villa game Arsene clearly had tonight’s game in mind when he made his team selection on Saturday. It may have slightly backfired given the result at the weekend but there’s a chance to put things right tonight. With players returning from injury Arsene Wenger has more of a luxury of players to select for the game than in past weeks, it may work in our favour, hopefully it will keep the starting eleven on their toes and inspire a great performance from each of them. In other Arsenal news Emmanuel Frimpong has been given clearance by FIFA to represent Ghana at international level. The Arsenal youngster has made no secret of his desire to represent the country of his heritage. It’s a shame he turned his back on England but you cannot deny anyone the right to represent their country of birth. Some things are bigger than football and his decision is one made from the heart. It may cause problems in future when you consider the African Cup of Nations but for now he is not part of the current first team and so his recuperation from injury is priority, once he gets to the level he has the potential to reach then we can curse his absence from the team. He seems to be doing ok on his loan at Charlton, he certainly won’t be given any easy treatment by the league one opposition, and he will be a marked man due to where he is on loan from and his status in the public. The experience will only make him stronger and more hungry to make up for lost time. It will be great to have him back, we have certainly missed the alternative dynamic to the midfield that Rosicky and Diaby can bring. Between the two we may get the opportunity of one or the other available for future match day squads continuously. Diaby is around 4 weeks away from returning to training so fingers crossed they both return and stay a little longer with us. Arsenal to sign Thierry Henry on loan? Arsenal legend, Thierry Henry, may very well return to Arsenal once more this January. Henry, who happens to be the all-time leading scorer for Arsenal, returned to his old club on loan last January during the Major League Soccer break. According to Arsene Wenger, Henry has trained with Arsenal three times now. When asked whether Wenger would sign Henry on loan again, he responded that he did not know yet, although he had not ruled it out. Wenger did add that the 35-year old striker was still looking sharp. Henry scored twice in his seven appearances during last season’s loan. He scored the lone goal in the 1-0 win over Leeds United in the FA Cup as well as scoring a classic extra time winner against Sunderland in the Premier League. Wenger signed Henry on loan last January due to winger Gervinho’s call up to international duty at the African Cup of Nations. Arsenal will be losing Gervinho once more, as they have decided to hold the African Cup of Nations two years in a row. Should Marouane Chamakh leave, Arsenal will find themselves short of strikers up top. Henry has scored a total of 228 goals during his time at Arsenal and was recently honoured during Arsenal’s 125th anniversary celebration with a statue outside of the Emirates Stadium. The only other Arsenal player to have a statue erected in his honour was former captain, Tony Adams. During his time at Arsenal, Henry led the team to two Premier League titles and three FA Cups. Wenger had nothing but good things to say about his former player, saying Henry’s return to the team would not only bring incredible skill to the field but invaluable experience to the squad. 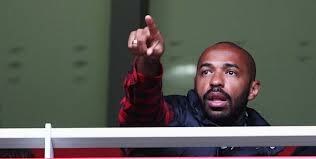 Wenger praised Henry’s communication and leadership qualities, claiming that he is a very intelligent person who would provide valuable advice to the team’s younger players. Although Arsenal were recently in a slump, they seem to have rebounded with an emphatic 5-2 win over London rival, Tottenham, as well as securing Championship qualification with a 2-0 win over Montpellier. Although striker Olivier Giroud was not able to score against his former team, he did provide two assists and has finally come into form, having scored five goals in his last six games. Wenger attributes Giroud’s late start due to the difficulty that new players have adjusting to the Premier League and the fact that he had to develop an understanding and comfort with his teammates. It took Giroud seven games to finally see the back of the net, and it is finally looking like he is regaining the confidence that saw him lead the French League in scoring last year with 21 goals. Per Mertesacker had similar problems adjusting last year, and has now become Arsenal’s most dependable defender. Mertesacker agreed that it took some time for him to settle at his new team, but he is now much more comfortable with the style with which Arsenal play. After a string of poor performances, the last two wins should instil some confidence into the club going forward. They are currently sitting in sixth place with 19 points, nine points behind league leaders, Manchester City. Their next game is on November 24th against Aston Villa. If you want to see the outcome, be sure to purchase your Arsenal tickets today. Support your favourite team on the field. Today’s guest post was brought to you by Matt Milstead. Mission accomplished, we are through to the last 16 in the champions league. There have been many big name scalps already so far in the competition and so our achievement carries more kudos. It hasn’t been pretty, after a good start to the group stages the games against Shalke did their best to derail our momentum and it was important that the team pulled together and ensured they ground out the results required to qualify from the group. Although winning the group is out of our hands it is not an impossible feat; we have learnt in the past how important winning the group is when the last 16 draws have been made. Arsene has a tough decision to make in the final game as players in need of a rest could get a well-earned breather but if we were to take the foot off the gas and Shalke did lose their last game it would be a gutting feeling. We will see, plenty football to be played before the next group fixture. On the game itself the first half seemed very nervy and flat. Although we didn’t seem to be under much threat from the Montpellier attack the impetus from our team with added home advantage was nonexistent. It was an easily forgettable half and one that had me feeling glad I was sat at home cosy watching on TV rather than witnessing it after parting with my hard earned cash and sitting in the cold November air. We went in at half time 0-0, there were a few grumbles from the home crowd however I will give them a benefit of the doubt they were grumpy from the weather. The second half had a much better outcome and brought the crowd back to life and happier times. It took about 4 minutes into the second half when Jack Wilshere managed to flick the ball past the keeper after a nice knockdown from Olivier Giroud playing against his old club. That was jack’s first goal since returning to first team duty and you could see the joy on his face as he reeled away to celebrate. The goal clearly removed the weight off our shoulders since a win was the minimum requirement from this game. Although the general team play didn’t improve too much from the first half the goal certainly raised the crowd and the atmosphere, the players started to grow into their play. About 12 or so minutes later we scored our second goal, and what a goal it was. 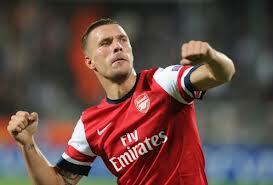 Lukasz Podolski who was clearly up for this game had a couple of chances that didn’t go his way earlier in the game. It was only a matter of time before he made his mark in the game which he sure did. Giroud was again the provider lofting the ball into Podolski’s path just inside the box. Still with plenty to do the German unleashed a powerful volley into the back of the net that the keeper had no chance in saving. The quality and technique of the volley was reminiscent of a Robin Van Persie volley scored against Charlton a few years ago. It was a special goal which ensured applause all around. We had our cushion which made the result pretty much assured on the night. The goal scored by Podolski is the exact type of goal that reminds us of why he is in the team, problem is when he isn’t scoring his contribution gets questioned. It was nice that he scored his goal, he looked dangerous all night and proved his worth to the team. The rest of the game was played out with less urgency as we did what was required for the night, as expected Shalke made sure they gained three points from their game against Olympiacos and so our win was vital to ensure qualification from the group. It was great for the defence to get a clean sheet last night. After all the plaudits from the early part of the season for our defence we went from shutting teams out to leaking goals at an alarming rate. I hope this is just the start of another prominent defensive run. Although comfortable against Montpellier there were still the odd moments where on another night we could have conceded. The important thing is the shut out will build the defenders confidence; as we all know football is all about confidence. Giroud is becoming invaluable to our plans. It was great to see Gervinho and Gibbs returning to the first team squad. Even though Gibbs didn’t get on the pitch his presence on the bench is enough to raise the spirits of the team and the fans. What we need now is strength in depth and options from the bench. The return of those two players will go a long way to boosting our fortunes. I suppose you can add Oxlade chamberlain to the list of returnees. Although he didn’t have the best of games, he is still finding his feet after injury himself. Next up is Aston Villa on Saturday, the dreaded 17.30 kick off slot. Lets carry on the momentum from the past two games and get a result at Villa park. It’s now Monday; the north London derby result is still fresh in the mind. As gooners we cannot let the opportunity pass to remind our spurs chums of the score. When you return to the office today look out for your spurs supporting colleagues and make sure they know the score. They are hurting right now and they need to feel even worse. We’ve been there, on the end of a bad result, you want the world to swallow you up. To lose a north London derby hurts even more, it hurts the spurs folk given the fact in all honesty they have closed the gap on us. A win against them is not a given like in the past, they believe they can beat us nowadays and for that reason it stings that bit more when they get beat. A five goal tonking is the icing on the cake and I will be sure to remind every person I know that follows that team. Special mention must go to every arsenal fan who crammed into the emirates on Saturday. I have experienced a rocking atmosphere at big games in the past but on Saturday I felt extra proud singing along with the fans around me. It was nonstop, we were up for it big time and let everyone know through our voices. Our away fans are famed for doing the arsenal proud singing strong whether we win, lose or draw. On Saturday the spirit of those away fans transferred into the gunners in the stadium as the decibels would have blown the roof off the emirates (if we had a roof). If the fortunes on the pitch were different maybe the atmosphere would have gone flat but they didn’t, we sang, the positive vibes from the stands can raise the players and so it dd. I wish we could maintain that atmosphere for the games deemed less important but that is something that would take time to instil. It is intimidating to play in a stadium with such electric atmosphere and I think the arsenal money men are missing a trick if they ignore ways to boost the atmosphere. Special mention goes out to Tottenham football club for their efforts in improving the environment. In these days going green is the way forward and it was nice of our not so successful neighbours for going out of their way to ensure the arsenal fans save on paper and wasting electricity creating new witty posters to gloat about the score on Saturday. The fact that we repeated the result from last season ensured we did not have to search too far looking for material to throw in the faces of the spurs fans. We still have our collection of 5-2 jpeg’s and didn’t have to dig far to post them back on facebook, twitter or on walls and telephone posts in the streets. Good on you spurs, by folding against us you helped the environment. It’s a short post today; I’m still recovering from birthday celebrations over the weekend (backed up so perfectly by the result on Saturday) and have only just started to regain enough vision to write this post. Please ensure you give the Tottenham fans hell for the whole week whether you work with them, they are your neighbours or distant friends on facebook. Stretch out the torture as long as possible, we won’t play them again for a while so make it count.